Saturday night’s Rockets win over Miami was the epitome of what all Houston fans thought they were going to get from Yao Ming when the Rockets drafted him as the #1 pick in the draft seven years ago. Accurate shooting, hard to defend in the post, good decision-making to kick the ball out when double or triple-teamed, etc. Yao played one of his best, and most consistent, games of the season as he broke a 32-year old Rockets’ team record, hitting more shots without a miss by going 12-for-12 on his way to racking up 26 points. He actually had secured the team record at 11-for-11, but obviously no one told him before he shot — and luckily made — a baseline jumper with the game in hand with less than a minute to play. Yao Ming was unstoppable against Miami’s short front line as he shot a perfect 12-for-12 from the field, a franchise record for shots in one game without a miss. Click here for more photos from the game. It wasn’t like he exploded in one quarter to make all his points. He was 5-for-5 in the first quarter, 2-for-2 in the second, 3-for-3 in the third, and 2-for-2 in the fourth. He also grabbed 10 rebounds and a couple of assists, choosing wisely when to shoot over his defender and when to pass to a cutter for an easy basket. Ironically, Yao attempted a difficult offensive move where he probably wouldn’t have made the shot, but he was called for traveling even though both Yao and coach Rick Adelman complained he had been held by a defender who caused him to travel. If the refs had let that travel go and Yao had put up that difficult shot, then we might not be talking about the team record that Yao broke. We all know what Yao is capable of doing. The guy who continues to exceed all expectations over the past 7 games, who received lots of attention during the Miami TV pregame coverage, was a big part of the Rockets’ offense in the first half Saturday night, is Von Wafer. Quick as a cat, Wafer was aggressive going to the hole a couple of times for layups or dunks, and tied Yao for high score in the first half with 15 points on 7-of-11 shooting, and played the most number of minutes by far for any Rocket in the first half – 22:46 of 24. He would miss all 7 of his shot attempts in the second half, maybe because he plays “all out” when he’s in the game, and because he played so many minutes in the first half. He finished with 17 on 7-of-18 shooting. I love watching his game. His confidence is really skyrocketing, and if he continues playing like this, he will continue to get big minutes even after McGrady comes back (if he does). After a sub-par performance (3-of-17 shooting) against Cleveland two nights before, Yao Ming came back strong against Miami to score 21 points on incredible 10-of-11 shooting while also grabbing 9 boards in a 112-100 win that gave the Rockets their 10th win in a row. Click here for more photos from the game. With the trade of Bonzi Wells, Mike James and Kirk Snyder within the past 24 hours, you wondered if the Rockets would have a lapse and not take care of business against a Miami team Thursday night that had lost 24 of its last 25 games. Or perhaps the Rockets would look ahead to their huge match-up Friday night against their toughest opponent, New Orleans, since Houston’s 9-game winning streak began – coincidentally against the same team to whom they traded Bonzi and James late Wednesday night. To the contrary, the Rockets came out on fire in the first quarter, making a statement to score the most number of points they have scored in a quarter this season, 41, and lead by 15 at the end of the first quarter. In that first quarter, the Rockets hit 17-of-21 shots and 4-of-5 from 3-point land. And get a load of these other first quarter numbers: Tracy McGrady hit 6-of-8 shots for 14 points. Yao Ming was 4-of-4 for 8 points. Rafer Alston was 4-of-5, including 3-of-3 from three-point land. And Luis Scola was 3-of-4 for 6 points. Amazing. 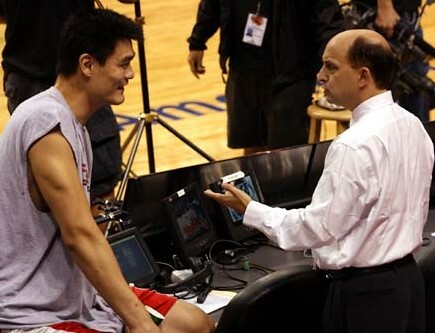 Yao Ming meets with former Rockets coach Jeff Van Gundy before the Houston-Miami game Friday night, November 23rd. Van Gundy was the ESPN television analyst for the game. This happened to be the most interesting photo from the night because the Rockets didn’t do anything interesting on the court, losing to a struggling Miami team. Houston has now lost 6 in a row and dropped below .500. Click here for more photos of Yao with Van Gundy, as well as more photos from the pre-game shootaround and the game. I’m tired of it, so this is going to be short. The Rockets lost to a very bad 2-9 Miami team that was 0-5 on their home court before beating the Rockets Friday night. Houston has now lost 6 in a row, with no end in sight. My, oh my, how this season has cratered so quickly. Miami gave them every chance to win, but the Rockets are so bad, you knew they wren’t going to be able to do it. Rick Adelman looks like he’s a deer caught in the headlights. McGrady: 7-of-20 from the floor. 5-of-10 from the free throw line. Inexcusable. Yao Ming got schooled by Shaq down low: 26 points and 14 rebounds. Shaq was obviously tired of being written off as a force. Yao scored 20 points on 8-of-13 shots. I feel bad for Luis Scola, who may be the Rockets’ best offensive player (9-of-15 for 18 points), and except for points from Yao, isn’t getting any help. Too bad it took idiot Adelman this long to figure out that he should be playing more. Adelman inexplicably keeps playing “0-fer” Alston: who was 1-for-6, and 0-for-3 from three-point territory. HOW LONG DOES IT HAVE TO TAKE? LESLIE ALEXANDER: PLEASE FIRE ADELMAN BEFORE THIS SEASON IS DOWN THE DRAIN! 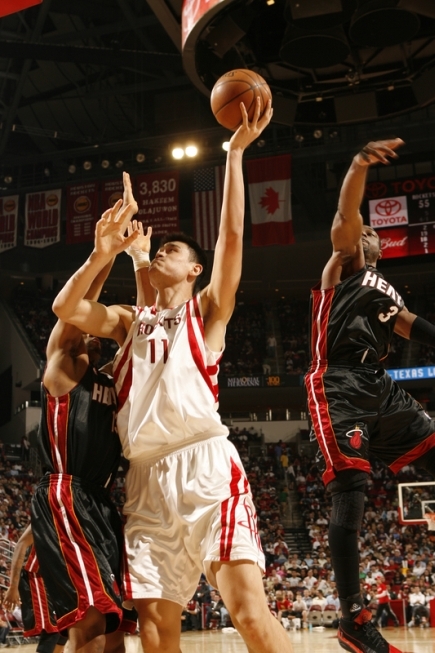 Yao participated in shootarounds before the Rockets-Heat game on Wednesday. A few hours later, Houston impressed by dominating the defending World Champs. Click here for more photos of Yao practicing before the game. The Rockets showed a national television audience Wednesday night that they are for real. They outplayed the defending World Champs Miami Heat to impress ESPN announcer Bill Walton so much in a 112-102 victory, they haven’t had that much love thrown their way in years. The Rockets put on a clinic in the first half to take a 63-48 lead, the most number of points they had in the first half this season. They hit 52.2% of their shots, including 6-of-14 three-pointers. Rafer Alston was a big part of that, filling it up with 4-of-6 treys for 12 point. And Houston had 17 assists compared to Miami’s 8 in the first half. Everything went their way. T-Mac shot an airball only to have it rebounded by a teammate for a basket, giving McGrady an assist. He made a shot from the baseline that banked off the glass accidentally. There was no drop-off in the second half, with the Rockets finishing with 50.6% shooting. They shot even better from behind the arc, making 9-of-16 three-pointers. McGrady scored 15 points in the second half to finish with 32 on 12-of-24 shooting. He also dished out 8 assists, many coming off beautiful laser-like passes. In the fourth quarter, he hit two three-pointers to hold off the Heat, as did Shane Battier (12 points) and Luther Head (10 points). Bonzi Wells played one of his best games of the season, scoring an efficient 11 points on 5-of-7 shooting. Alston had one of his best games, scoring 20 points on 7-of-15 shooting, including 6-of-10 three-pointers and only two assists. Sadly, Dwyane Wade separated his shoulder in the fourth quarter. I had never seen him in such pain, and was pretty bummed since I love the guy for what he did against Dallas last season, but also because they head to Dallas and play the Mavericks on Thursday, and I wanted him to take over and beat them again. Now the Heat have no chance. Yao contests a shot of Shaq’s Sunday night in Miami. Yao got the better of Shaq with 34 points and 14 rebounds, and arguably is now the NBA’s best center. Click here for the game story. For more photos from the game, click here. Photo courtesy Getty Images. Despite Yao’s contention and humility, an official “changing of the guard” took place last night in Miami. Yao forgets that Shaq’s NBA Finals performance last season was just so-so, averaging less than 14 points and scoring less than 10 points twice in the 6-game series. There’s almost no way that Yao would put up that low of numbers in a Finals the way he’s playing now. And he’s putting up bigger numbers than Shaq (14 ppg) all the time now. The entire country — having access to watching the game nationally on ESPN – could see for themselves just how good Yao is. He’s hitting fallaway jumpers with consistency, hook shots in the lane, running the floor for layups, even throwing up tough left-handed shots while falling to the floor, and most of them are going in. 11-of-19 went in last night. He’s also money from the line, which Shaq is definitely not. Yao made 12-of-13 free throws. It’s clear just how much of a force Yao is now in the league. He’s also playing pretty good defense. After Shaq made his first 4 shots with relative ease against Yao, he only made 2-of-10 the rest of the way (6-of-14 was the final total). Sure, Yao is not playing a perfect game. He still got blocked a couple of times, but he’s better than any other center in the league. I even like how he’s keeping his cool. Shaq doesn’t like the notion of having been replaced as the NBA’s ‘best center’ or even ‘most dominant,’ so he threw a couple of shots at Yao that showed how much of a thug he can be. Battling for position for a rebound, Shaq threw an obvious elbow at Yao’s head that sent him falling to the floor in pain. Later he pushed Yao with his left arm while Yao was vulnerable in mid-air while going up for a rebound. Yao didn’t lose his composure and retaliate against Shaq because of these cheap shots. I probably would have, but that just shows how much Yao is under control mentally of his game right now. This game was also a statement game for the Rockets. They showed the world how good they are, beating the defending World Champions and extending their record to 5-2. And they are doing all of this with Tracy McGrady struggling from the floor. T-Mac only hit 6-of-18 shots for 12 points, but he’s showing how great of a difference maker he can be by making excellent decisions with the ball and dishing out a game-high 8 assists. Until T-Mac gets back to normal with his jump shot, I think he should just continue going to the rack to get easier shots, which he did a few times Sunday on some highlight reel plays. As far as the other Rockets, most notable was Shane Battier continuing to make solid contributions with 11 points (5-of-10 shooting) and 3 assists. I remember seeing a couple of weeks ago the results of a survey of NBA General Managers asking them what was the most consequential trade during the off-season, and the Rockets acquisition of Battier for a draft day trade of Rudy Gay ranked #1. After seeing Battier play this season in the Rockets lineup, I think I would have to agree with them. I also think a lot of people who didn’t like that trade might have changed their mind by now. Chuck Hayes also made his presence felt by battling hard for rebounds (6) and scoring on some nifty moves around the basket using the rim well to shield against getting his shot blocked. He did run into Shaq in the second half and hyperextended his left knee. Looking at the replay on TV, you can tell it really hurt. Hopefully he will be okay because they really need his garbageman mentality. Juwan Howard came in to replace Hayes, and he did a pretty good job, 2-of-5 shots and grabbing four boards. Luther Head continues to play extremely well, hitting 4-of-9 shots (3-of-6 treys) to score 11 points. SUNDAY, 1/29/06 – I spent most of my Sunday finishing up a big project for work I have been working on the past few weeks, and preparing for a move that kept me from watching the Miami game Sunday afternoon. By reading what happened in Rockets’ 101-95 loss, I didn’t miss much. The move will also keep me from watching Monday night’s game against Memphis. Like the Rockets, I almost feel like I have been going through a spell of bad luck by not being able to watch the Rockets very much recently. The good thing is that Yao may play on Monday. If he does, though, you know it’s going to take him awhile to get back his conditioning after missing 21 games in a row. Yao shoots a jump hook over Alonzo Mourning in Miami Thursday night, and was playing very well against him in the first half, scoring 14 points. 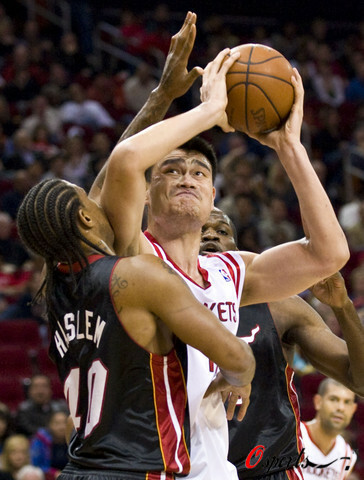 But in the fourth quarter, Yao and Houston’s offense struggled again and they lost their third straight, 88-84. For more photos from the game, click here. THURSDAY, 11/10/05 – This is getting ridiculous. In my last post after Tuesday night’s game (see entry directly below), I mentioned maybe the Rockets might eventually regret trading point guard Mike James during the off-season because they could really use his offense right now. Well, I don’t think we have to wait any longer: trading Mike James was a mistake. When I first heard about the trade on October 4th, I cringed. But I thought we should give it a chance because the Rockets usually know what they are doing. But without Tracy McGrady in the lineup, these Houston guards are ‘offensively’ terrible right now, no pun intended. Yao lowers a shoulder into Shaq on Tuesday night in Houston as both big men played each other for only the second time this season. Yao played only 25 minutes because of foul trouble, scoring 12 points and grabbing 9 rebounds. But the Rockets still managed to beat the Heat, 84-82. Click here for more photos from the game. TUESDAY, 3/22/05 – It wasn’t pretty, but it’s a win. Houston overcame lots of mistakes on Tuesday night to still hold on and beat the Miami Heat 84-82 in Houston to halt their 12-game winning streak. The Heat have been a scoring machine during their streak, averaging 103.1 points per game. But Jeff Van Gundy’s defense proved to be too much for the Heat to handle, who scored 21 points under their scoring average. It was a defensive battle from the start, with Miami also holding the Rockets scoreless until 8:14 remaining in the first quarter until Yao hit a fadeaway over Shaq to make it 4-2, Miami. It looked like the Rockets main deficiency since Juwan Howard got hurt a few games, power forward, was going to continue to be a problem in this game when Howard’s replacement, Clarence Weatherspoon, missed his first two shots from the left baseline by jacking up two air balls. But ‘Spoon improved, hitting his next four shot attempts throughout the game (including a nice running hook shot in the lane, and a long jumper from the top of the key) and hitting all four of his free throws to score 12 points total. You have to give him credit for recovering so well after the air balls. He even had a couple of steals and two assists in a crucial part of the fourth quarter to show that he can be a worthy replacement while Juwan heals. Weatherspoon, at 6’4”, even guarded Shaq a few times! Speaking of Shaq, he and scoring sidekick Dwyane Wade got off to a slow start, missing their first six shots collectively in the first quarter, and as a team Miami only made 4-of-16. Meanwhile, T-Mac took it strong to the hole a couple of times and scored on highlight reel dunks that brought the house down! After the first quarter, the Rockets held a surprising 20-16 lead against the Eastern Conference’s best team, and were out-rebounding them, too. The second quarter was a different story, with Shaq and Wade getting on track and scoring 10 points and 9 points, respectively. Shaq even faked out Yao so bad on a spin move for a layup, it was one of Yao’s most embarrassing moments this year. It was so fast, he didn’t seem to know what hit him. Houston struggled in the second quarter shooting 25%, and the Heat took advantage by turning a 7-point deficit in the first quarter into an 11-point lead, 41-30. The Rockets made a slight run to close the gap to 41-36 at halftime, but the stat sheet looked awful. 31% shooting by halftime, 0-for-10 from three-point territory (David Wesley was 0-for-5 on three-point attempts). What kept Houston in the game in the first half was T-Mac’s 12 points, 8-for-8 team shooting from the free throw line, a 25-20 rebounding advantage (Dikembe Mutombo had 7, six offensive; Yao had 5), and only six turnovers. In the second half, Yao picked up his fourth foul with a little over 5 minutes remaining in the third quarter, and had to check out of the game. The Head led 53-49 at the time. With Yao out of the game, that’s when the Rockets made their move. The Rockets went on a 12-2 run, thanks to the Heat missing four free throws in a row (two by Shaq), to lead 61-55 at the end of the three quarters. It could have been 63-55 if Dikembe hadn’t missed two free throws at the end of the quarter to snap an amazing 18-for-18 streak from the free throw line. By the time Miami’s Alonzo Mourning tipped in a shot at the 9:47 mark in the fourth quarter to the Rockets lead to 63-57, the Heat had missed 9 shots in a row and hadn’t scored in 7 minutes. The Rockets maintained their lead, and pushed it to 80-72 with 40.5 seconds remaining when Mike James hit a big three-pointer that seemed to ice the game. Miami’s Damon Jones hit a three-pointer to close it to 80-75, and after the Heat fouled James intentionally, James went to the line and missed both free throws! On the ensuing Miami possession, Jones hit a wild three-pointer, and was fouled by James during the shot. Jones went to the line and closed the gap to 80-79 with 14.3 seconds remaining, putting thoughts of Choke City into Rocket fans’ heads. The rest of the game turned into a free throw shooting contest, with David Wesley hitting two big free throws and Wade missing a couple of his to seal it for the Rockets. Yao was largely ineffective in the second half because of foul trouble, playing only 7 minutes in the third quarter and one minute in the fourth before fouling out. Although he scored 12 points (5-of-11 shooting) and grabbed 5 boards, the Rockets made their run to win this game without him. Shaq easily outplayed Yao, scoring 23 points and grabbing 16 boards. Instead, Yao’s substitute, Dikembe, was amazing. Although he scored 8 points, more importantly he kept possessions alive by grabbing 15 rebounds, eight that were offensive. Coupled with Mutombo’s rebounding was Houston’s stellar defense. The Rockets limited Miami to only 30 points in the paint while Miami average 44 points, third best in the league. Those 30 points allowed in the paint are right at Houston’s league-leading average. But the Rockets were lucky to win this game. They committed several mistakes that could have cost them, like Mike James missing all four of his free throws in the fourth quarter, the Rockets missing 7-of-8 free throws down the stretch, and Rocket defenders fouling Eddie Jones and Damon Jones on three-pointers, resulting in two four-point plays in the same game! I don’t even know if that has ever been done before. Yao tries to defend Shaq on Sunday afternoon in Miami. Although Yao (22 points, 9 rebounds) got the better of Shaq statistically (15 points, 5 boards), the Heat pulled away in the fourth quarter and won 104-95. For more photos from the game, click here. SUNDAY, 1/30/05 – After Sunday’s game in Miami between the Rockets and the Heat, the good news is that far from being demolished by a motivated Shaq, Yao played well against the “Most Dominant Ever.” The bad news is that the Rockets lost another game (104-95) they could have won, and Bob Sura injured his hand and was taken off the court to get immediate x-rays. In what was to be the twelfth chapter in the Clash of the Titans, both Yao and Shaq were saddled with foul troubles, so it was up to the smaller guys to duke it out. The first quarter started slow for both big men, with Shaq being called for traveling and Yao missing his first two shots. Barely four minutes into the game, Yao was benched with his second personal foul. With Yao out of the game, the Heat relied on Shaq’s presence in the lane to draw double-teams, resulting in passes to open shooters on the perimeter. The Heat scoring was spread evenly among their starters, whose speed and athleticism were difficult for the Rockets’ defense to handle. Luckily, Sura decided to take over on the offensive end, easily cutting into the lane for layups or trips to the charity stripe. Sura ended the 1st quarter with 12 points. Yao was 0-2 with two fouls. Michael Doleac to start the quarter, but Shaq came back and stopped the mismatch Yao temporarily enjoyed. The two centers seemed to be motivated to play against each other, with both men scoring four quick points. Shaq picked up a third foul late in the second quarter, but the Rockets didn’t give Yao any touches during those minutes. The Rockets ended the half down by two points, 48-46. The Rockets started the second half slowly and seemed to forget that Yao even existed. In a frustrating quarter, Dwyane Wade through sheer speed split defenders and got into the paint at will, drawing fouls or hitting big buckets and scoring 11 in the third quarter. Shaq was surprisingly quiet, preferring to pass the ball to teammates. Yao was on the opposite end of the spectrum, being wide open with single coverage under the basket, only to be ignored by his teammates completely. Starting the fourth quarter the Rockets were within three points of the Heat. But the game that was within reach soon started to slip away. Two free throws and a 3-point shot from Eddie Jones quickly put the Rockets behind 8 points and resulted in a Jeff Van Gundy timeout. Yao roared back and grabbed a big offensive rebound only to be fouled hard by Doleac. On the next play Yao received a pass with Shaq guarding him and, in a move we haven’t seen for a while, did a quick turnaround without lowering the ball and shot over Shaq for a bucket. But soon after those plays, Yao collected two bad fouls guarding Shaq. Dikembe Mutombo came in and rebounded well; tipping to himself three times in a row and drawing Shaq’s fourth foul. Unfortunately, Mutombo could not match Shaq’s strength or Wade’s quickness and picked up two quick fouls himself. Wade, who didn’t play as many minutes as normal due to three fouls in the first quarter, exploded in the fourth, giving the Heat a 12 point lead when Yao came back into the game with five minutes to go. two free throws and a nice bucket to end any Rockets hope. In a daring move by the Heat, Shaq stayed near the basket with Yao the only Rocket near him on an alley-oop play in the last 40 seconds that would have been icing on the cake for Shaq if Yao had not stolen the inbound pass. Late in the fourth, Sura left the game with an apparent right ring finger injury from trying to guard Shaq. Sura was led off the court to have x-rays done on his hand. If the Rockets lose Sura to injury, it will be a huge blow since the Rockets need the points he provides (21 points on Sunday) from his position. We’ll find out soon enough after the Rockets make a long flight on Sunday up the east coast to take on Boston on Monday night. You are currently browsing the archives for the vs. Miami category.